When coming to a new area, like the Pocono Mountains, you may wonder what things you can do in the area to amuse yourself while on your trip. One of the big draws to our area is spending time outdoors. In any season the Pocono Mountains are stunning. One close by town that has many activities, Honesdale, PA. There are many things to do in Honesdale, PA and we at Ledges Hotel love helping our guests decide on what their itinerary should be while on their trip, even if it means leaving our town for another. Here are our top 3 fun things to do in Honesdale, PA. The Cooperage: This wonderful place is always one of our suggestions for things to do in Honesdale, PA because of the array of events that are held at The Cooperage. The main categories for events at The Cooperage are, performances, markets, learning, and good times. All of these events are also broken down a bit more. Performances are bands, artists, and much more. Their market consists of a farmers market where the community and farmers come together to buy and sell delicious food. Learning is any type of class that can be held at The Cooperage. Lastly, good times is family fun that can be a game night or an open mic night. The main goal of The Cooperage is to bring the community together in various ways which makes this one of our top fun things to do in Honesdale, PA.
Himalayan Institute: If you are looking to center yourself, find yourself, and relax, then the Himalayan Institute needs to be a the top of your list of things to do in Honesdale, PA. This amazing organization uses yoga, holistic health, spirituality, and mediation to help you find your balance. They strive to use a balance of Western and Eastern practices to find the right harmony for each person. Before going, be sure to check out their website to fully understand how great their programs all and how they can help you best. Prompton State Park: If you are looking to enjoy the outdoors then there are many outdoorsy things to do in Honesdale, PA, especially when you visit Prompton State Park. This is a popular spot throughout the year because there are so many great things to do. One way to spend some time at Prompton State Park is to hike it. There are 26 miles of trails that go all around the park and vary in length and difficulty. If you love to go biking, all of these trails are open to mountain biking as well. 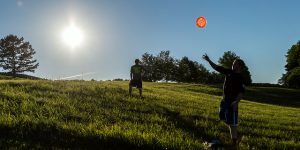 On sport you can enjoy also while at Prompton State Park is disc golf. There is an 18 hole course set up in the park. Another sport that is frequently enjoyed in the park is hunting so be sure to be careful for hunters while you are exploring. If you enjoy being on the lake then bring your boat and have a blast seeing the sights of the park. Be sure to check out their rules on boats. However you decide to discover Prompton State Park, it is one of the best things to do in Honesdale, PA.
As you can see, there are many ways to discover and enjoy the Pocono Mountains. One way that many visitors choose is to stay with us at Ledges Hotel. Our modern hotel is a perfect place to spend the night, relax during the day, and meet with friends at night. Our rooms are decorated in a simple, contemporary way and each offer amazing views of our nearby gorge. For dinner, be sure to book a table at our in house restaurant, Glass, the perfect place to get some delicious food and enjoy our great views. Contact our amazing staff today and let us help you plan a great trip including these fun things to do in Honesdale, PA.